Each month the Anoka Knights of Columbus choose a family that models Christian family values and visibly live by them every day. 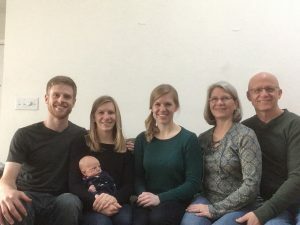 The family chosen for March 2019 is the Knapek Family. Dan and Cheryl Knapek have been parishioners at St. Stephen’s since 1987. The Knapeks have been married for 34 years and have two adult daughters, Kelley and Lisa. When the girls were young, they volunteered together at church and in the community and helped their elderly neighbors on a regular basis. Kelley continues to serve others as a volunteer high school coach and Lisa plays violin for Mass at church. Dan co-chairs the St. Nicholas Breakfast, and volunteers at the Knights of Columbus Anoka Haunted House and the Knights of Columbus Turkey Bingos. He also volunteers his time as a member of the City of Anoka Charter Commission. Cheryl is a member of the Adult Contemporary Choir and coordinates the food for the Fall Fest. Together they are part of the main kitchen help for the Lenten Fish Fries and help with the Knights of Columbus breakfasts. As a family the Knapeks enjoy camping, hiking, fishing and just spending time together. With their daughter, her husband and new grandson living in Colorado, Dan and Cheryl make time to travel to see them.